Every now and then I tend to splurge on a good bag or pair of shoes, but never a trash can. However in this case, after a lengthy search for the perfect pick for my kitchen, I decided to give this Simplehuman Voice Activation Sensor Can ($200) a try. For the obvious reason that it's just a place to put garbage, I was initially resistant to purchase such an expensive product. Honestly, now I can't imagine living without it. It's like this weird friend I have when I'm cooking. If you've ever had your hands full while preparing a meal you would understand why it comes in handy. In the past I've had the kind that you step on but it started leaving marks on my tile floor. It was also leaving dents on my wall from always moving around and the lid hitting it. This can has a number of features that sold me. There are two ways to open it; either wave your hand over the sensor near the top or simply shout out "open can". I know it seems crazy, but it's actually really nice when you're in a rush or needs hands-free help. It features an easy-to-change bag compartment in the back that holds the bags. When you need to replace one, just pull one out (kind of like a tissue box). It's both battery operated and can plug into the wall, depending on which preference you prefer. 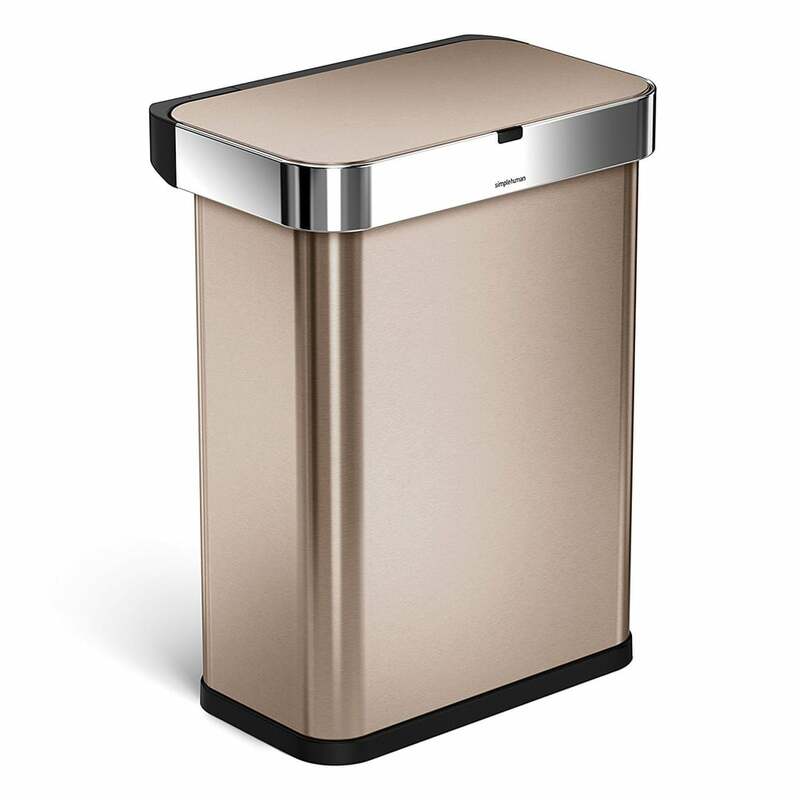 Simplehuman offers it in five different stylish colors, including white and rose gold! The stainless steel texture doesn't leave finger prints behind and also keeps germs away. 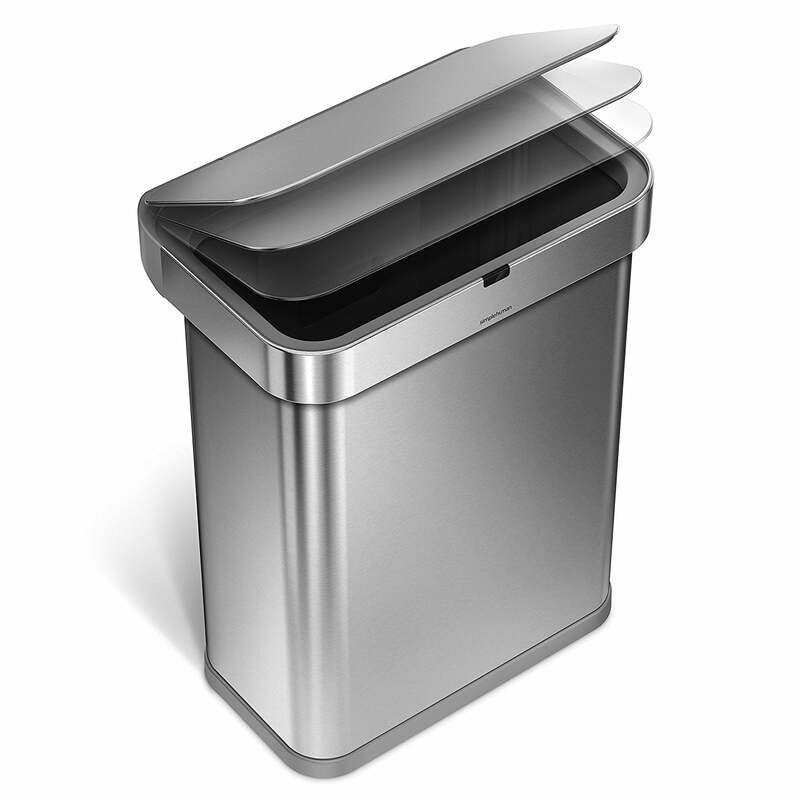 Not all garbage cans have to be dirty. In addition to it actually being useful, I have to say this is quite the entertainment piece. Every time I have guests over they find it hilarious. In one instance, my parents came to visit and they spent about 20 minutes yelling "open can" in various voices to see how many the can would recognize. Try it for yourself to see how many different ways you can say "open can".